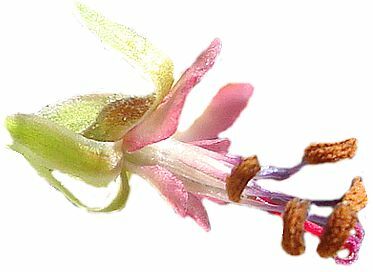 Summer deciduous, widely spaced, stipules herbaceous, caducuous, narowly triangular, to 2.2 x 1.5 mm (length x width). Petiole terete, 8-12 mm long, lamina pinnatisect, oblong to elliptic in outline, 10-70 x 10-15 mm, carnose, pinnae alternate, rhomboid to obtrullate, to 7 x 6 m, plicate, unequally lobed, lobes narrowly to broadly cuneate, adaxially and abaxially strigulose. Rachis persistent. 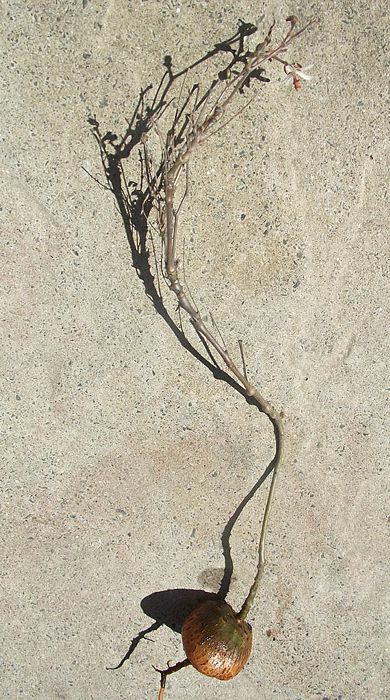 Terminal, rachis to 90 mm long, of 3-4 internodes, each bearing 3-5 pseudo-umbels in succession, with pinnatifid reduced leaves to 6 mm long at nodes. Peduncles terete, to 40 mm long, presudo-umbels 3-4 flowered. Pedicels terete, 2.5-7 mm long, covered in short hairs and glandular hairs. 5, narrowly elliptic, with narrow hyaline margins, posterior 6.6 x 1.5 mm, lateral and anterior sepals 5.5 x 1.4 mm, hypanthium 4-8 mm long, indumentum identical to pedicels. 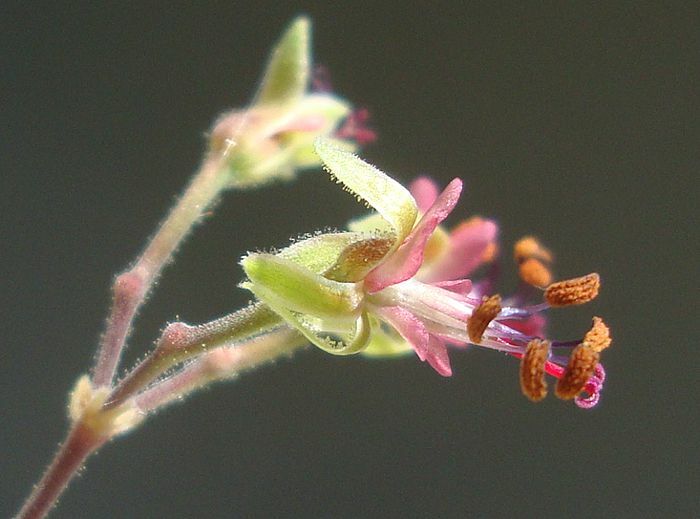 Fertile stamens 5, exerted, posterior to 6.2 mm long, median 3.0-5.6 mm. Credit: ©Graham A. Henning & Jonathan B. Ball, reproduced with permission (1). 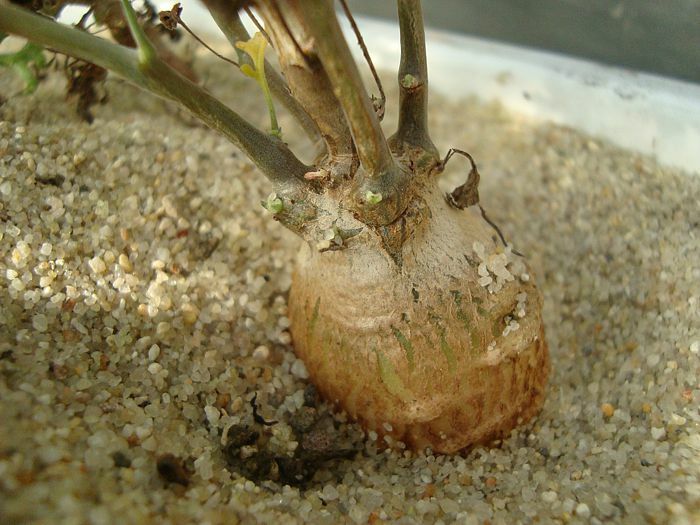 P. pachypodium from the type locality as discovered and collected by researchers studying moths and butterflies, for which P. pachypodium were found to be the larval host-plants. The photograph clearly shows semi-persistent petioles and rachises, but also swollen nodes, on a single branch. A photograph of the flowers of P. pachypodium from the type locality at Keiskie Poort (Northern Cape), taken in December, clearly showing a winter-growing, summer-flowering species. 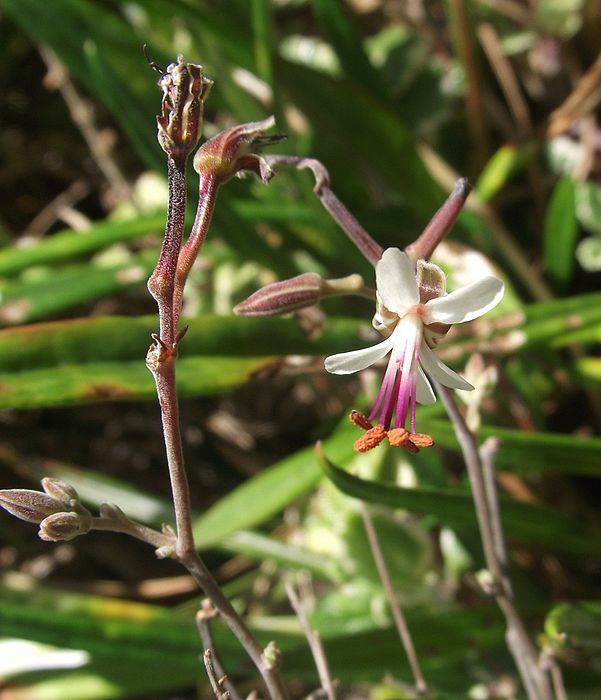 The flower structure is the same as that of the plant pictured with the species description (ex MV4855), from north of Matjiesfontein (Western Cape). 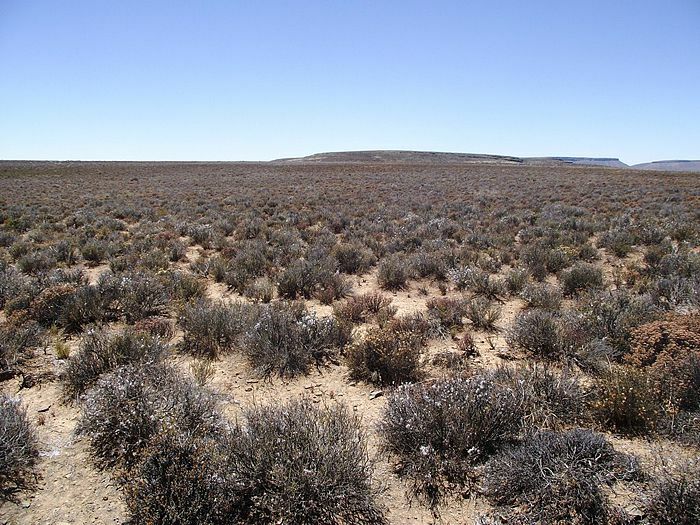 The flat landscape at Keiskie Poort, with the Hantamberge in the back. The plants grow in the shade of shrubs, making their way through to the sun and pollinators. This is an area that can easily see -10 oC in the winter and a meagre 100-200 mm of rainfall per year. Credit: Graham A. Henning & Jonathan B. Ball, reproduced with permission (1). 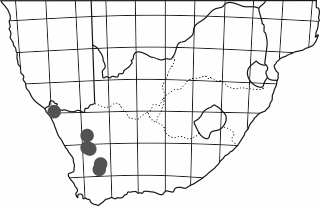 Although P. pachypodium has been described as known from its type locality at Keiskie Poort only (S Calvinia, N Cape), several collections have been made of caudiciform plants, with flowers similar (in shape, colour and diversity) to P. parviflorum. 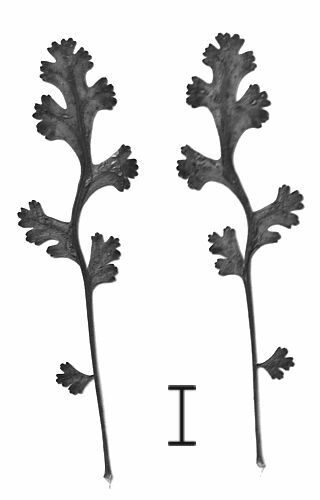 Many of these collections have been in cultivation for several decades and several have recently been described as "species" based on such cultivated (sometimes single) specimens (2). 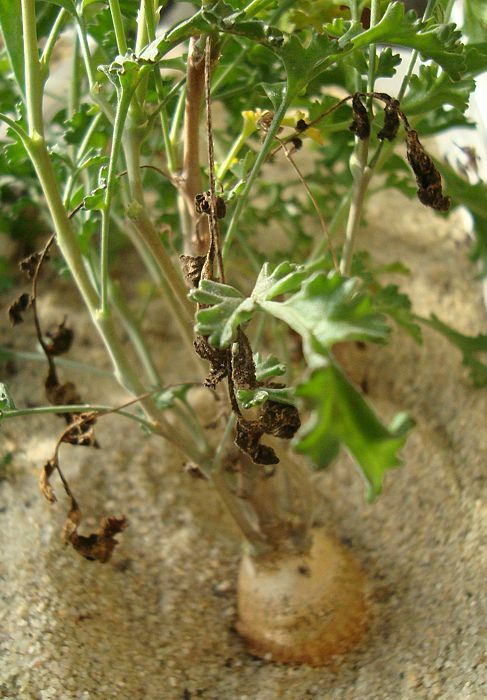 In the light of variability of cultivated Otidia section plants and their proneness to hybridise, as discussed elsewhere, and in the absence of any significant fieldwork validating (or not) the minute differences between the collected specimens, it would seem appropriate to consider P. vassari, P. occultum and P. arthriticum as synonymous with P. pachypodium. With thanks to David Victor, John Lavranos and Matthias Becker for useful discussions. (1) Henning, G. A., Ball, J. B., Metamorphosis 23 (2013) 1-7. (2) Geraniaceae Group Associated Notes no. 82 (2016) pp.8-12.